Our latest installment of the Third Sunday Lord’s Table was held on February 18th during our worship service. The theme of this month’s celebration was, ‘…when I was a stranger’ and was based on portions of Matthew 25. We celebrate our Lord’s Table every third Sunday with an eye towards reminding all that the Sacrament of Communion is in truth a call to action, a call to engage in some of the most pressing social issues and sources of injustice of the day. In an era of great uncertainty regarding our commitment as a nation to continue to ‘welcome the stranger’ into our midst this theme was chosen to highlight those concerns and to encourage those participating to reflect and take a position regarding what our Lord is calling for in this radical call to truly welcome them all into the family and fellowship of our Lord. The morning’s altar was truly one of our Lord’s tables. It was intended to be a simple yet powerful symbol reminiscent of some of the hot-button issues surrounding the immigration debate currently being waged in Congress. A symbol of the ways in which, and the energy with which we seek to separate ourselves off from others…comprised of a small table surrounded by a high fence which even concealed the very bread and wine of the sacrament which Christians are called to share…as though only those on the ‘inside’ of the fence might be allowed to partake. However it was also a sign of hope in that the table was covered with word-signs of welcome and inclusion that were used to mask over previously posted signs of unwelcome and division. The ‘fenced’ or ‘walled off’ table’ set for the morning worship was holy because our Lord made it so, and because our Lord is always present in the breaking of the bread and the sharing of the one cup…and also so on this day because in order to partake of the sacrament it was necessary to lift both of the elements up and out of the space in which they were held captive. In this sacrament a call was issued to all present to take a stand on welcoming the stranger amongst us. In particular, an appeal was made to never again objectively label those in our country without proper documentation as ‘illegals’ or ‘aliens’ as these terms are nothing other than nasty pejoratives and are not loving or welcoming by any stretch. For more insight refer to The Pastor’s Pen post for February 18th. Lord may it be increasingly so that our ministry of love and compassion in your name reaches more and more of your people in need as our awareness of, and engagement with all that would continue to divide and separate us as your family, begins to break down barriers of fear and prejudice so that truly all will feel free to come from the east and the west, and from the north and the south. This morning’s altar truly is one of our Lord’s tables. It is a simple yet powerful symbol of the ways in which, and the energy with which we seek to separate ourselves off from others…it is a small table surrounded by a high fence which even conceals the very bread and wine we are called to share one with another…as though only those on the inside of the fence might partake. However it is also a sign of hope in that the table has been covered with words of welcome and inclusion that have been used to mask over previously posted words of unwelcome and division. 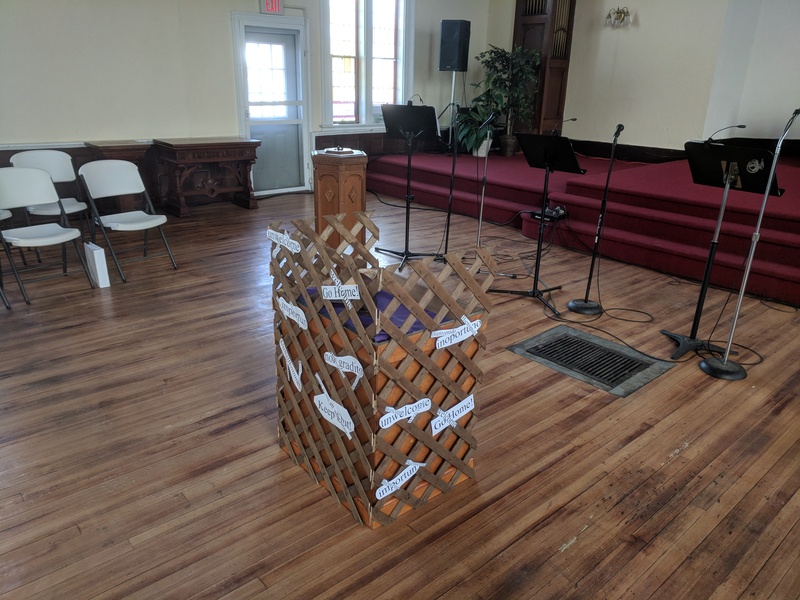 The ‘fenced off and previously divisive table’ set before us this morning is holy because our Lord has made it so and because our Lord is always present in the breaking of the bread and the sharing of the one cup. Let us reverence this meal shared together in love, may it bless our bodies just as it moves us to greater compassion to care for, to lift up, and to insist that all of our actions become more directed towards reverencing the holiness and right of all people to drink from the cup of salvation in the full fellowship of one loving and welcoming community. May the grace of God’s persistent love find its way into the inner spaces of our hearts just as it calls us to greater trust in the one who came that we all might truly be set free. One: God, help us welcome those who have come to dwell among us. All: God, help us welcome those who have come to dwell among us. All: When, Lord, were you a stranger that we welcomed among us? All: When we welcomed the stranger, we welcomed you, Christ Jesus, in our midst! One: Loving God, you call us to create hospitable communities. Grant that we may all live together in peace and love.